Reed Gunther » Archive » MOON GLOOM! When the Earth is destroyed, the lonely Moon must find a new planet to orbit. 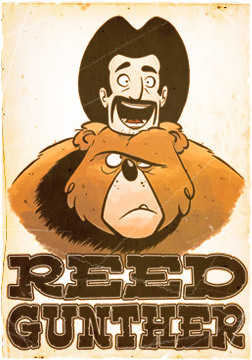 Filled with gags, adventure and silliness, this 14 page comic by the creators of Reed Gunther is a goofy ride for all-ages. Here’s the only catch… we’re selling digital copies of Moon Gloom for $0.99. Why you ask? (Here’s where I bring it back around to Reed Gunther…) Chris and I are very hard at work on trying to create as many Reed Gunther stories as we can. Issue #5 will be coming out this winter which means the first story arc of Reed Gunther will be coming to a close which means… trade paper back collection! Since we don’t want to sell you the same thing twice, what do you think about seeing Reed Gunther in COLOR?! 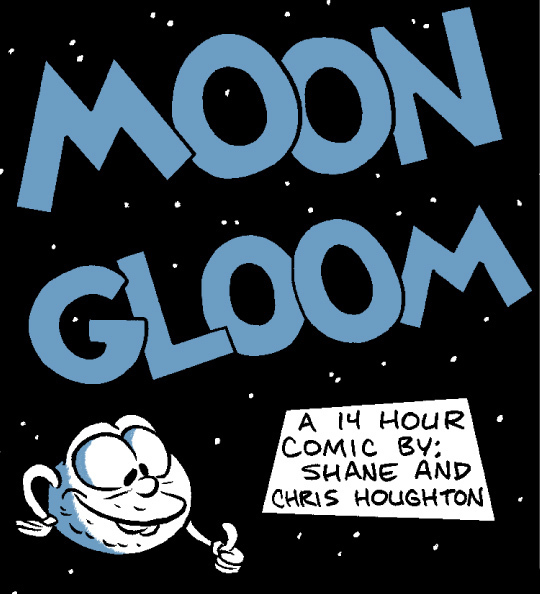 With the funds we raise from the digital downloads of Moon Gloom, Chris and I are saving up to hire a colorist so all of our adventures can be in glorious and exciting CMYK (color, that is)! Check out the colored example posted above and tell me a whole issue of Reed Gunther looking like that wouldn’t be AWESOME. Plus it’s only 99 cents for 14 pages of fun comic adventure, plus 5 extra pages of sketches, concept art, and our rough sketched out “script”! So instead of buying that new Lady Ga Ga song today, buy a comic! Still not convinced to check out Moon Gloom? Here’s a 4 page preview to get you started! Download Moon Gloom right now for only $0.99 via paypal and help us get Reed Gunther in color! *UPDATE* Once your payment goes through at paypal, a pop up window will show you the page where you can download the comic. If your browser blocks popups, simply click on the link on the paypal receipt page that says “Return to Reed Gunther Comics” or “Return to Merchant” and that will bring you to the correct page. If you need any help getting the download, email us at mail@reedgunther.com. If you really would like to help us out, you may want to consider purchasing one of the original pages from Moon Gloom for only $50! Check out the next post for more details. Thanks for all your support and be sure to let us know what you think of Moon Gloom in the comments below!